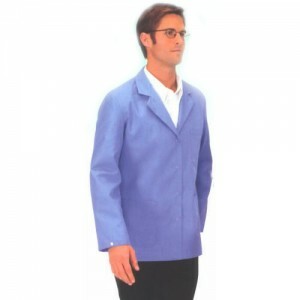 Nylostat garment made of a heavy poly-cotton blend Hip-length jacket made of royal blue Nylostat. 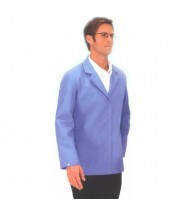 Due to the lower carbon content, this garment is not groundable with ESD cuffs or key option. This Nylostat garment was formerly produced by Angelica and is ideal for less-sensitive applications where a heavier fabric is preferred, such as at soldering stations where soldersplash is a concern. 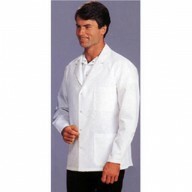 A common misconception is that cotton garments are cooler, but this Nylostat garment is considerably heavier and therefore warmer than a lightweight garment made of the polyester OFX-100 or ECX-500 fabrics. 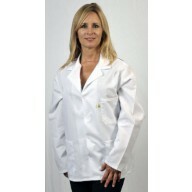 The Tech Wear 361ACS-5X is an ESD-safe hip length lab jacket made from Tech Wear's Nylostat material which protects sensitive electronics from even the smallest volts of static electricity.